Hello everyone, like most people I know I suffer from those unsightly and sometimes painful spots. I've struggled with most spot treatments as I have senstive combination skin and alot of treatments have left my skin dried out, caused worse breakouts and at times left me with tight, painful skin. 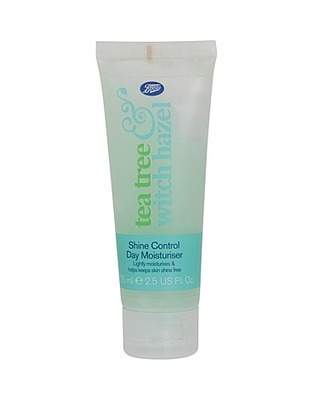 About a year ago I decided to try out the boots tea tree and witch hazel range and have to say this is the first spot treatments that have worked for me and if I stray away from using them I notice how my skins condition returns to its previously bad condition. In this blog post I will give you my opinions on the products I have tried from this range. This is by far my favorite product from this range. I find this moisturiser does exactly what it says on the packaging. The moisturuiser is a gel consistancy that absorbs into the skin quite quickly and it leaves the skin with a matte finish, I find this is great for a base for under my foundation and find no use for a primer any more. Although this moisteriser is light I find it provides my skin with enough moisture and doesn't cause it to dry out. At first I wasn't sure about this night treatment gel as I found the consistancey more watery than the the day moisturiser and wasn't sure if this would have any effect on any breakouts. After using it for a week I soon realised this treatment gel really did do my skin some favors. I noticed that any spots I had would be noticably better the morning after applying the gel. I also didn't find this treatment drying my skin out which is a big plus as I've had so much trouble with treatments causing dry flaky skin in the past. I usually apply this after I've removed my makeup and used a face wash to clense my skin just before bed. Prior to purchasing this blemish stick I have owned the the Witch blemish stick which I found really good so I thought this product would be a cheaper dupe. And I feel I was right. I apply this directly to spots and blemishes and I found it helps reduce redness, I also found my spots and blemishes seem to fade a lot faster when I use this blemish stick. I would reccomend this for anyone that loves direct treatments and for those whom have dry skin and can't use all over face treatments. I also found this helps reduce ichyness from insect bites for anyone that wants an alternative use for this product. I bought this product on a whim as Boots had a three for two offer on. I have to say I'm not really convinced this product has helped my skin in anyway but then again I don't really use face mask so I don't know what makes a good or bad one. I did find however it left my skin feeling refreshed so thats a plus. The prodct itself has quite a thick sticky consistancy which I found made it hard to apply properly. Will I be repurchasing this product, I'm afraid not. I tell you now do not buy this product at least not for a face scrub. This scrub is far to harsh to be used on the face the efoliating particals are to corse for the delicate skin on the face and I found my skin sore and red after only one use of this product. I did however find this scrub quite useful as a body scrub so all was not lost. Once again I will not be repurchasing this product. All in all I've been quite impressed with this range and plan to try the rest of the range. These products are all relatively cheap and made even cheaper by the fact Boots usually have a three for two offer on this range so this is definitely one for the bargin shoppers out there.